Life is full of rude awakenings. There’s a skiff of snow on the ground this morning but not enough that I need to haul out my boots to go to work. The weather has been brutal recently with major flooding around Ottawa. I hope everyone affected can recover so that their lives can get back to normal. I want to thank all the friends and families that came into Comet Comics on FREE COMIC BOOK DAY to make the day fun and happy. Spreading the joy of comic books always makes me feel warm inside. I’ll be making my first road trip to Killarney, Ontario to visit my old friend Ron later this week. I’ll return in time for Ottawa ComicCon even though I won’t be attending. Pike and pickerel season opens this coming weekend so I will be out on the lake trying my luck with my buddy Matt. I will be interested to see how high the water level is and if that affects where the fish will be. Black Bolt #1 – Saladin Ahmed (writer) Christian Ward (art) VC’s Clayton Cowles (letters). This is one of them artsy fartsy first issues where it took way too long to get the story started. Black Bolt waking up in a prison is repeated three times and I almost stopped reading after the third time. The nice art kept me going until the last page but even though Saladin made it so that this isn’t just a comic book starring a mime dressed in black, I wasn’t impressed enough to want to keep reading. I also didn’t like the downward arrow attached to the tuning fork on his head. Jack’s original design was just fine. Eternal Empire #1 – Sarah Vaughn (writer) Jonathan Luna (art, script assist, letters). This new fantasy story is about a worker who escapes from a farm. She’s essentially a slave. The kingdom is ruled by an empress who is praised or is forced to be praised by all. I love Jonathan’s art and the slave’s quest has caught my fancy so I’m hoping she finds her happily ever after. Jean Grey #1 – Dennis Hopeless (writer) Victor Ibanez (art) Jay David Ramos (colours) VC’s Travis Lanham (letters). I am not a fan of the bangs. So I was wishing for the young X-Men trapped in the present from the past to get their own book and this is sort of that but the focus is on Jean. Dennis impressed me with his run on Spider-Woman and he starts off here explaining how this Jean Grey isn’t all those other Jean Greys that existed before. Well, that’s not confusing much. Young Jean is having lunch in Kyoto, Japan and all of a sudden she has to play super hero because the Wrecking Crew is robbing an armoured truck. Ugh. I would have believed Jean fighting some evil mecha a whole lot more. Then a major distraction helps the bad guys get away. Holy smokes, there’s so much contrived nonsense that I can’t go on reading. Sorry Jean. I hope the big flaming bird doesn’t burn you to a crisp. Ab Irato #1 – Thierry Labrosse (writer & artist) Jeremy Melloul (English translation) Andworld Design (letters). The title is Latin for “from anger” and it’s an angry populace living in Montreal 100 years in the future. It looks like the Saint Lawrence river has risen a lot due to climate change and the city resembles Venice in Italy. A young lad from the country has arrived in Montreal to seek his fortune while a rebellion is taking place. Thierry’s art is beautiful and I like the naïve Riel so I’m going to see what happens to him in this 6-issue mini from Germany. All-New Guardians of the Galaxy #1 – Gerry Duggan (writer) Aaron Kuder (art) Ive Svorcina (colours) VC’s Cory Petit (letters). This relaunch is part of Marvel’s Galactic Realm and we’re back to a team of five with Drax, Gamora, Groot, Rocket and Star-Lord. I relished every issue of the last run and this debut was fun. The team gets tangled in some one-upmanship between The Grandmaster and The Collector so the threat to life and limb is quite high. This is more comedy caper than universe saving so I might read this just for the halibut. Oh, and it explains why Groot is a baby too. Guardians of the Galaxy: Mother Entropy #1 – Jim Starlin (writer) Alan Davis (pencils) Mark Farmer (inks) Matt Yackey (colours) VC’s Cory Petit (letters). The second of three Guardians of the Galaxy comic books to hit the racks just before the movie Guardians of the Galaxy Vol. 2 hits theatres May 5 features the team trying to work off their debts. It was fun to see one of Jim’s creations show up to complicate the Guardians’ mission. This story has a universe ending threat but it’s kind of silly. I can’t say that I like Alan’s versions of Star-Lord and Gamora. Peter Quill looks like Douglas Fairbanks and Gamora’s wide features are not pretty to me. She looks more like She-hulk than the deadliest hottie in the universe. Guardians of the Galaxy – Mission: Breakout #1 – Christopher Hastings (writer) Edgar Salazar (pencils) Allen Martinez (inks) Andrew Crossley (colours) VC’s Clayton Cowles (letters). The Collector’s name is Taneleer Tivan. Learn something new every day. The third of three Guardians of the Galaxy comic books to hit the racks just before the movie Guardians of the Galaxy Vol. 2 hits theatres May 5 features the team trying to escape from the clutches of The Collector. Y’think he’s in the movie? This was a fun space romp with superb art. I liked Gamora a lot more in this comic book. Savage Things #3 – Justin Jordan (writer) Ibrahim Moustafa (art) Jordan Boyd (colours) Josh Reed (letters). The bad guys want to cause a black-out in New York City. That can’t be good. Superman #22 – Peter J. Tomasi & Patrick Gleason (writers) Doug Mahnke (art) Jaime Mendoza & Ray McCarthy (inks) Wil Quintana (colours) Rob Leigh (letters). This is some good stuff right here. Lois makes a surprising discovery that leads to some scary action with creepy townsfolk. There are more surprises in store as “Black Dawn” continues. Doug’s art is so good in this. I’ve stopped reading a lot of DC books but this issue is a good example of why I’ve stuck with this title. Paper Girls #14 – Brian K. Vaughn (writer) Cliff Chiang (art) Matthew Wilson (colours) Jared K. Fletcher (letters). I hope this isn’t the “season finale” and we have to wait three months for the next issue because this issue has one heck of a cliff (Chiang) hanger. Spider-Man/Deadpool #17 – Joe Kelly (writer) Ed McGuinness (pencils) Mark Morales & Walden Wong (inks) Jason Keith & Matt Yackey (colours) VC’s Joe Sabino (letters). The story of Spider-Man’s crisis of conscience continues. Will he kill Itsy Bitsy or will Wade save Peter’s soul? I am staying tuned. 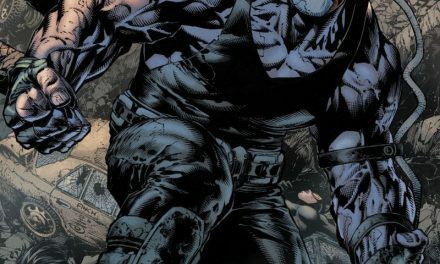 Batman #22 – Joshua Williamson & Tom King (writers) Jason Fabok (art) Brad Anderson (colours) Deron Bennett (letters). The best thing about part 3 of “The Button” is that I wasn’t confused because I didn’t read part 2 in Flash #21. The bad thing is that the time traveling and other dimensional paradoxes made me grind my teeth in frustration. Father Thomas Wayne meeting alternate son Bruce Wayne was touching but I did not believe for a second that what Thomas asked Bruce to do would become reality. If none of the Watchmen show up in this story I will be sorely disappointed. Riverdale #2 – Greg Murray & Daniel King (writers) Joe Eisma & Thomas Pitilli (art) Andre Szymanowicz (colours) John Workman (letters). Got my teen drama fix for the week. I am so glad they updated these old characters to make them more relevant and multidimensional. Spider-Man #16 – Brian Michael Bendis (writer) Oscar Bazaldua (art) Justin Ponsor (colours) VC’s Cory Petit (letters). This issue starts with the opening salvo of a turf war between the Black Cat and another crime boss. Man, Oscar draws a super cute Felicia Hardy. Then we get back to the complicated life of Miles Morales. I liked how he blew off steam there. The Unstoppable Wasp #5 – Jeremy Whitley (writer) Elsa Charretier (art) Megan M. Wilson (colours) VC’s Joe Caramagna (letters). The members of G.I.R.L. (Genius In action Research Labs) gathers for the first time to try and defuse the bomb in Ying’s neck. It’s Nadia AKA The Unstoppable Wasp, Taina Miranda (engineer), Alexis Miranda (Taina’s sister), Lashayla Smith (physicist), Priya Aggarwal (biologist) and Ying (chemist and ex-Red Room roomy of Nadia’s). I liked that the girls don’t save the day which sets up a meeting with the villain. Hello Mother. Mark Waid (writer) Humberto Ramos (pencils) Victor Olazaba (inks) Edgar Delgado & Nolan Woodard (colours) VC’s Clayton Cowles (letters). How do the kids deal with the Freelancers stealing their brand? Find out in this terrific issue. I love team books that explore the interpersonal relationships of the team members and Mark does some interesting exploring here. I would find this book boring if the Champions just went from issue to issue dealing with crises and fighting bad guys. The last page will put a crimp in the team’s roster. Jessica Jones #8 – Brian Michael Bendis (writer) Michael Gaydos (art) Matt Hollingsworth (colours) VC’s Cory Petit (letters). Jess has a new case and her client is Maria Hill, ex-director of S.H.I.E.L.D. Maria is wants to know who is trying to kill her. My favourite Bendis books have a lot of dialogue and this issue has loads.